When winter fails to take its exit cue, the underwater world slows down. Migrations are postponed and late winter patterns linger, creating spectacular opportunities for the walleye-season opener. Mike Christensen has been guiding walleye fishermen on opening day in Minnesota for 17 years, and says there should be some great shallow water walleye fishing on tap as soon as the season opens May 11. This year, Christensen predicts walleyes will linger in the shallows well after the season opener. 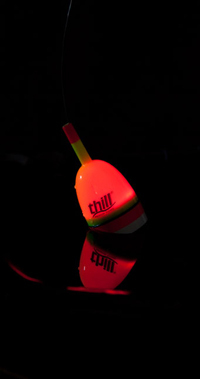 Christensen employs a simple system at night, using livebait under lighted slip floats. In colder water, bobber techniques provide walleyes with plenty of time to look things over. The movement of living bait becomes the final trigger. Christensen and his clients primarily use leeches in spring, but spottail shiners and crawlers also come into the equation. Christensen’s night rig starts with 6-pound mono or copolymer line. He first puts a Thill Premium Bobber Stop from 2 to 4 feet up the line, then slides on a bead, then the float. He uses a jig or hook and crimps on a #0 or #1 Soft Shot 18 inches above it. Christensen said he prefers the Lindy Brite floats because of the brass grommets at each end. The brass keeps the line from wearing a grove in the stem, which can affect the way it slides on the line. “At night, that’s a big deal because you can’t see it happening. If that bait isn’t getting close to bottom in a cold spring, your chances of hooking up get pretty slim,” he said. The terminal end of the rig is either a size #4 octopus hook or a 1/32-ounce jig. In calm nights he prefers a glow-red Lindy Frosty jig tipped with leeches, and in windy conditions he’s found that a 1/32-ounce Lindy Jig is more effective. He uses the bare hooks when walleyes are very picky. Christensen uses 7 ½- to 8 ½-foot, medium-power spinning rods with extra fast tips. They provide more casting distance, hold lines higher out of the waves, and provide a better hookset. A long rod also fits his active fish style. The extra length is more efficient at making the pops and twitches he continually employs to attract active walleyes. 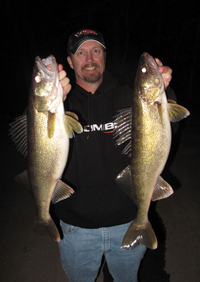 Finding walleyes at night can be as easy as finding the warmest water—especially around the opener when weather patterns are colder than normal. He says that during a cold, late spring walleyes will be feeding so shallow he can hear them broaching the surface to feed. The warmest water will have the most baitfish, and big ‘eyes won’t be far away. “This year I’m sure we’ll be targeting shallow reefs a lot at night, but anywhere you find sand-to-rock transitions, you’ll find walleyes on the opener,” he said. Walleyes can be spooky at night, especially in shallow water, so Christensen glides in with the wind behind him, shuts off the engine, and coasts to his anchoring point. Spooking fish leads to a boring night. Tying too many knots with complicated rigs will dampen enthusiasm just as quick. Simple systems are far more enjoyable in the dark, when walleyes linger in shallow water for weeks. Christensen says; "we spend more time fishing off docks and wading at night in a late spring because walleyes stay shallow as long as the water stays cool." Christensen said he prefers the Lindy Splash Brite floats because of the brass grommets at each end. The brass keeps the line from wearing a grove in the stem, which can affect the way it slides on the line.